Whatboy Games is an indie studio about to launch its debut title, but you probably know the games its co-founders have worked on. Game director Adam Doherty spent 11 years at Rocksteady as lead gameplay coder on the Batman: Arkham games, and studio director Dax Ginn spent nearly seven as a marketing producer on those titles. Now, Whatboy’s first game is a month away from its debut on Steam Early Access. 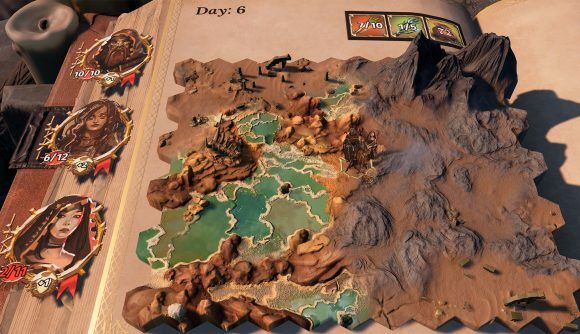 Trials of Fire is a single-player, turn-based strategy game where you guide a party through an overworld map depicting a cataclysmic fantasy land. Your home needs resources, and your goal is to wander the wastes and bring those vital supplies back to the settlement. Narrative encounters will force you to make moral decisions as you go. Combat has you drawing cards to use abilities and repositioning your heroes to make the most of those attacks, and your options will present unique synergies based on what cards you play and when. Between encounters, switching around your characters’ gear loadout will alter what card abilities they have access to in battle. While former developers are working on something of their own, we’re still waiting to see what the new game from Rocksteady proper will be. People in the know have shot down the possibility of a Superman game, and it feels like the time is right for something other than Batman – but we’re still waiting to see what’s next.